Field Marshal Jan Christiaan Smuts PC, OM, CH, DTD, ED, KC, FRS (24 May 1870 – 11 September 1950) was a South African statesman, military leader, and philosopher. In addition to holding various cabinet posts, he served as prime minister of the Union of South Africa from 1919 until 1924 and from 1939 until 1948. Although Smuts had originally advocated racial segregation and opposed the enfranchisement of black Africans, his views changed and he backed the Fagan Commission's findings that complete segregation was impossible. Smuts subsequently lost the 1948 election to hard-line nationalists who created apartheid. He continued to work for reconciliation and emphasised the British Commonwealth’s positive role until his death in 1950. He led a Boer Commando in the Second Boer War for the Transvaal. During the First World War, he led the armies of South Africa against Germany, capturing German South-West Africa and commanding the British Army in East Africa. From 1917 to 1919, he was also one of the members of the British Imperial War Cabinet and he was instrumental in the founding of what became the Royal Air Force (RAF). He became a field marshal in the British Army in 1941, and served in the Imperial War Cabinet under Winston Churchill. He was the only person to sign both of the peace treaties ending the First and Second World Wars. A statue of him stands in London's Parliament Square. He was born on 24 May 1870, at the family farm, Bovenplaats, near Malmesbury, in the Cape Colony. 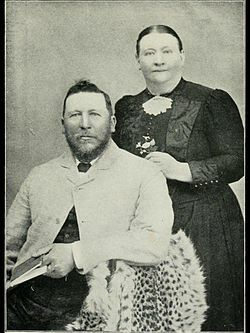 His parents, Jacobus Smuts and his wife Catharina, were prosperous, traditional Afrikaner farmers, long established and highly respected. As the second son of the family, rural custom dictated that he would remain working on the farm; a full formal education was typically the preserve of the first son. In 1882, when Jan was twelve, his elder brother died, and Jan was sent to school in his brother's place. Jan attended the school in nearby Riebeek West. He made excellent progress here, despite his late start, and caught up with his contemporaries within four years. He moved on to Victoria College, Stellenbosch, in 1886, at the age of sixteen. At Stellenbosch, he learned High Dutch, German, and Ancient Greek, and immersed himself in literature, the classics, and Bible studies. His deeply traditional upbringing and serious outlook led to social isolation from his peers. He made outstanding academic progress, graduating in 1891 with double first-class honours in Literature and Science. During his last years at Stellenbosch, Smuts began to cast off some of his shyness and reserve, and it was at this time that he met Isie Krige, whom he later married. On graduation from Victoria College, Smuts won the Ebden scholarship for overseas study. He decided to travel to the University of Cambridge in the United Kingdom to read law at Christ's College. Smuts found it difficult to settle at Cambridge. He felt homesick and isolated by his age and different upbringing from the English undergraduates. Worries over money also contributed to his unhappiness, as his scholarship was insufficient to cover his university expenses. He confided these worries to a friend from Victoria College, Professor J. I. Marais. In reply, Professor Marais enclosed a cheque for a substantial sum, by way of loan, urging Smuts not to hesitate to approach him should he ever find himself in need. Thanks to Marais, Smuts's financial standing was secure. He gradually began to enter more into the social aspects of the university, although he retained his single-minded dedication to his studies. During his time in Cambridge, he found time to study a diverse number of subjects in addition to law. He wrote a book, Walt Whitman: A Study in the Evolution of Personality, although it was unpublished until 1973. The thoughts behind this book laid the foundation for Smuts' later wide-ranging philosophy of holism. Smuts graduated in 1894 with a double first. Over the previous two years, he had been the recipient of numerous academic prizes and accolades, including the coveted George Long prize in Roman Law and Jurisprudence. One of his tutors, Professor Maitland, a leading figure among English legal historians, described Smuts as the most brilliant student he had ever met. Lord Todd, the Master of Christ's College, said in 1970 that "in 500 years of the College's history, of all its members, past and present, three had been truly outstanding: John Milton, Charles Darwin and Jan Smuts." In December 1894, Smuts passed the examinations for the Inns of Court, entering the Middle Temple. His old Cambridge college, Christ's College, offered him a fellowship in Law. Smuts turned his back on a potentially distinguished legal future. By June 1895, he had returned to the Cape Colony, determined to make his future there. Smuts began to practise law in Cape Town, but his abrasive nature made him few friends. Finding little financial success in the law, he began to divert more and more of his time to politics and journalism, writing for the Cape Times. Smuts was intrigued by the prospect of a united South Africa, and joined the Afrikaner Bond. By good fortune, Smuts' father knew the leader of the group, Jan Hofmeyr. Hofmeyr in turn recommended Jan to Cecil Rhodes, who owned the De Beers mining company. In 1895, Smuts became an advocate and supporter of Rhodes. When Rhodes launched the Jameson Raid, in the summer of 1895–96, Smuts was outraged. Feeling betrayed by his employer, friend and political ally, he resigned from De Beers, and left political life. Instead he became state attorney in the capital of the South African Republic, Pretoria. After the Jameson Raid, relations between the British and the Afrikaners had deteriorated steadily. By 1898, war seemed imminent. Orange Free State President Martinus Steyn called for a peace conference at Bloemfontein to settle each side's grievances. With an intimate knowledge of the British, Smuts took control of the Transvaal delegation. Sir Alfred Milner, head of the British delegation, took exception to his dominance, and conflict between the two led to the collapse of the conference, consigning South Africa to war. On 11 October 1899, war was declared with a Boer offensive into the British-held Natal and Cape Colony areas, Boer republics, beginning the Second Boer War. In the early stages of the conflict, Smuts served as Paul Kruger's eyes and ears, handling propaganda, logistics, communication with generals and diplomats, and anything else that was required. In the second phase of the war, Smuts served under Koos de la Rey, who commanded 500 commandos in the Western Transvaal. Smuts excelled at hit-and-run warfare, and the unit evaded and harassed a British army forty times its size. President Kruger and the deputation in Europe thought that there was good hope for their cause in the Cape Colony. They decided to send General de la Rey there to assume supreme command, but then decided to act more cautiously when they realised that General de la Rey could hardly be spared in the Western Transvaal. Consequently, Smuts was left with a small force of 300 men, while another 100 men followed him. By this point in the war, the British scorched earth policy left little grazing land. One hundred of the cavalry that had joined Smuts were therefore too weak to continue and so Smuts had to leave these men with General Kritzinger. Intelligence indicated that at this time Smuts had about 3,000 men. To end the conflict, Smuts sought to take a major target, the copper-mining town of Okiep. With a full assault impossible, Smuts packed a train full of explosives, and tried to push it downhill, into the town, where it would bring the enemy garrison to its knees. Although this failed, Smuts had proved his point: that he would stop at nothing to defeat his enemies. Norman Kemp Smith wrote that General Smuts read from Kant's Critique of Pure Reason on the evening before the raid. Smith contended that this showed how Kant's critique can be a solace and a refuge, as well as a means to sharpen the wit. Combined with their failure to pacify the Transvaal, Smuts' success left the United Kingdom with no choice but to offer a ceasefire and a peace conference, to be held at Vereeniging. Before the conference, Smuts met Lord Kitchener at Kroonstad station, where they discussed the proposed terms of surrender. Smuts then took a leading role in the negotiations between the representatives from all of the commandos from the Orange Free State and the South African Republic (15–31 May 1902). Although he admitted that, from a purely military perspective, the war could continue, he stressed the importance of not sacrificing the Afrikaner people for that independence. He was very conscious that 'more than 20,000 women and children have already died in the concentration camps of the enemy'. He felt it would have been a crime to continue the war without the assurance of help from elsewhere and declared, "Comrades, we decided to stand to the bitter end. Let us now, like men, admit that that end has come for us, come in a more bitter shape than we ever thought." His opinions were representative of the conference, which then voted by 54 to 6 in favour of peace. Representatives of the Governments met Lord Kitchener and at five minutes past eleven on 31 May 1902, Acting President Burger signed the Peace Treaty, followed by the members of his government, Acting President de Wet and the members of his government. For all Smuts' exploits as a general and a negotiator, nothing could mask the fact that the Afrikaners had been defeated and humiliated. Lord Milner had full control of all South African affairs, and established an Anglophone elite, known as Milner's Kindergarten. As an Afrikaner, Smuts was excluded. Defeated but not deterred, in January 1905, he decided to join with the other former Transvaal generals to form a political party, Het Volk (People's Party), to fight for the Afrikaner cause. Louis Botha was elected leader, and Smuts his deputy. When his term of office expired, Milner was replaced as High Commissioner by the more conciliatory Lord Selborne. Smuts saw an opportunity and pounced, urging Botha to persuade the Liberals to support Het Volk's cause. When the Conservative government under Arthur Balfour collapsed, in December 1905, the decision paid off. Smuts joined Botha in London, and sought to negotiate full self-government for the Transvaal within British South Africa. Using the thorny political issue of South Asian labourers ('coolies'), the South Africans convinced Prime Minister Sir Henry Campbell-Bannerman and, with him, the cabinet and Parliament. Through 1906, Smuts worked on the new constitution for the Transvaal, and, in December 1906, elections were held for the Transvaal parliament. Despite being shy and reserved, unlike the showman Botha, Smuts won a comfortable victory in the Wonderboom constituency, near Pretoria. His victory was one of many, with Het Volk winning in a landslide and Botha forming the government. To reward his loyalty and efforts, Smuts was given two key cabinet positions: Colonial Secretary and Education Secretary. Smuts proved to be an effective leader, if unpopular. As Education Secretary, he had fights with the Dutch Reformed Church, of which he had once been a dedicated member, which demanded Calvinist teachings in schools. As Colonial Secretary, he opposed a movement for equal rights for South Asian workers, led by Mohandas Karamchand Gandhi. During the years of Transvaal self-government, nobody could avoid the predominant political debate of the day: South African unification. Ever since the British victory in the war, it was an inevitability, but it remained up to the South Africans to decide what sort of country would be formed, and how it would be formed. Smuts favoured a unitary state, with power centralised in Pretoria, with English as the only official language, and with a more inclusive electorate. To impress upon his compatriots his vision, he called a constitutional convention in Durban, in October 1908. There, Smuts was up against a hard-talking Orange River Colony delegation, who refused every one of Smuts' demands. Smuts had successfully predicted this opposition, and their objections, and tailored his own ambitions appropriately. He allowed compromise on the location of the capital, on the official language, and on suffrage, but he refused to budge on the fundamental structure of government. As the convention drew into autumn, the Orange leaders began to see a final compromise as necessary to secure the concessions that Smuts had already made. They agreed to Smuts' draft South African constitution, which was duly ratified by the South African colonies. Smuts and Botha took the constitution to London, where it was passed by Parliament and given Royal Assent by King Edward VII in December 1909. The Union of South Africa was born, and the Afrikaners held the key to political power, as the majority of the electorate. Although Botha was appointed prime minister of the new country, Smuts was given three key ministries: Interior, Mines, and Defence. Undeniably, Smuts was the second most powerful man in South Africa. To solidify their dominance of South African politics, the Afrikaners united to form the South African Party, a new pan-South African Afrikaner party. The harmony and co-operation soon ended. Smuts was criticised for his overarching powers, and the cabinet was reshuffled. Smuts lost Interior and Mines, but gained control of Finance. This was still too much for Smuts' opponents, who decried his possession of both Defence and Finance: two departments that were usually at loggerheads. At the 1913 South African Party conference, the Old Boers (Hertzog, Steyn, De Wet), called for Botha and Smuts to step down. The two narrowly survived a confidence vote, and the troublesome triumvirate stormed out, leaving the party for good. With the schism in internal party politics came a new threat to the mines that brought South Africa its wealth. A small-scale miners' dispute flared into a full-blown strike, and rioting broke out in Johannesburg after Smuts intervened heavy-handedly. After police shot dead twenty-one strikers, Smuts and Botha headed unaccompanied to Johannesburg to resolve the situation personally. Facing down threats to their own lives, they negotiated a cease-fire. But the cease-fire did not hold, and in 1914, a railway strike turned into a general strike. Threats of a revolution caused Smuts to declare martial law. Smuts acted ruthlessly, deporting union leaders without trial and using Parliament to absolve him and the government of any blame retroactively. This was too much for the Old Boers, who set up their own National Party to fight the all-powerful Botha-Smuts partnership. During the First World War, Smuts formed the Union Defence Force. His first task was to suppress the Maritz Rebellion, which was accomplished by November 1914. Next he and Louis Botha led the South African army into German South-West Africa and conquered it (see the South-West Africa Campaign for details). In 1916 General Smuts was put in charge of the conquest of German East Africa. Col (later BGen) J.H.V. Crowe commanded the artillery in East Africa under General Smuts and published an account of the campaign, General Smuts' Campaign in East Africa in 1918. Smuts was promoted to temporary lieutenant general on 18 February 1916. While the East African Campaign went fairly well, the German forces were not destroyed. Smuts was criticised by his chief Intelligence officer, Colonel Richard Meinertzhagen, for avoiding frontal attacks which, in Meinertzhagen's view, would have been less costly than the inconsequential flanking movements that prolonged the campaign where thousands of Imperial troops died of disease. Meinertzhagen believed Horace Smith-Dorrien (who had saved the British Army during the retreat from Mons), the original choice as commander in 1916 would have quickly defeated the German commander Colonel (later General) Paul Emil von Lettow-Vorbeck. As for Smuts, Meinertzhagen wrote: "Smuts has cost Britain many hundreds of lives and many millions of pounds by his caution...Smuts was not an astute soldier; a brilliant statesman and politician but no soldier." Meinertzhagen wrote these comments in October/November 1916, in the weeks after being relieved by Smuts due to symptoms of depression, and he was invalided back to England shortly thereafter. Smuts was promoted to honorary lieutenant general for distinguished service in the field on 1 January 1917. Early in 1917 Smuts left Africa and went to London as he had been invited to join the Imperial War Cabinet and the War Policy Committee by David Lloyd George. Smuts initially recommended renewed western front attacks and a policy of attrition, lest with Russian commitment to the war wavering, France or Italy be tempted to make a separate peace. Lloyd George wanted a commander “of the dashing type” for the Middle East in succession to Murray, but Smuts refused the command (late May) unless promised resources for a decisive victory, and he agreed with Robertson that Western Front commitments did not justify a serious attempt to capture Jerusalem. Allenby was appointed instead. Like other members of the War Cabinet, Smuts' commitment to Western Front efforts was shaken by Third Ypres. In 1917, following the German Gotha Raids, and lobbying by Viscount French, Smuts wrote a review of the British Air Services, which came to be called the Smuts Report. He was helped in large part in this by General Sir David Henderson who was seconded to him. This report led to the treatment of air as a separate force, which eventually became the Royal Air Force. By mid-January 1918 Lloyd George was toying with the idea of appointing Smuts Commander-in-Chief of all land and sea forces facing the Turks, reporting directly to the War Cabinet rather than to Robertson. Early in 1918 Smuts was sent to Egypt to confer with Allenby and Marshall and prepare for major efforts in that theatre. Before his departure, alienated by Robertson's exaggerated estimates of the required reinforcements, he urged Robertson's removal. Allenby told Smuts of Robertson's private instructions (sent by hand of Walter Kirke, appointed by Robertson as Smuts' adviser) that there was no merit in any further advance and worked with Smuts to draw up plans, reinforced by 3 divisions from Mesopotamia, to reach Haifa by June and Damascus by the autumn, the speed of the advance limited by the need to lay fresh rail track. This was the foundation of Allenby's successful offensive later in the year. Like most British Empire political and military leaders in World War I, Smuts thought the American Expeditionary Forces lacked the proper leadership and experience to be effective quickly. He supported the Anglo-French amalgamation policy towards the Americans. In particular, he had a low opinion of General John J. Pershing's leadership skills, so much so that he wrote a confidential letter to Lloyd George proposing Pershing be relieved of his command and that the US forces be placed "under someone more confident, like himself". This did not endear him to the Americans once it was leaked. Smuts and Botha were key negotiators at the Paris Peace Conference. Both were in favour of reconciliation with Germany and limited reparations. Smuts advocated a powerful League of Nations, which failed to materialise. The Treaty of Versailles gave South Africa a Class C mandate over German South-West Africa (which later became Namibia), which was occupied from 1919 until withdrawal in 1990. At the same time, Australia was given a similar mandate over German New Guinea, which it held until 1975. Both Smuts and the Australian Prime Minister Billy Hughes feared the rising power of Japan in the post First World War world. When former German East Africa was divided into three mandated territories (Rwanda, Burundi, and Tanganyika) Smutsland was one of the proposed names for what became Tanganyika. Smuts, who had called for South African territorial expansion all the way to the River Zambesi since the late 19th century, was ultimately disappointed with the League awarding South-West Africa only a mandate status, as he had looked forward to formally incorporating the territory to South Africa. Smuts returned to South African politics after the conference. When Botha died in 1919, Smuts was elected prime minister, serving until a shocking defeat in 1924 at the hands of the National Party. After the death of the former American President Woodrow Wilson, Smuts was quoted as saying that: "Not Wilson, but humanity failed at Paris." While in Britain for an Imperial Conference in June 1921, Smuts went to Ireland and met Éamon de Valera to help broker an armistice and peace deal between the warring British and Irish nationalists. Smuts attempted to sell the concept of Ireland receiving Dominion status similar to that of Australia and South Africa. As a botanist, Smuts collected plants extensively over southern Africa. He went on several botanical expeditions in the 1920s and 1930s with John Hutchinson, former botanist-in-charge of the African section of the Herbarium of the Royal Botanic Gardens and taxonomist of note. Smuts was a keen mountaineer and supporter of mountaineering. One of his favourite rambles was up Table Mountain along a route now known as Smuts' Track. In February 1923 he unveiled a memorial to members of the Mountain Club who had been killed in World War I. How can the inferiority complex which is obsessing and, I fear, poisoning the mind, and indeed the very soul of Germany, be removed? There is only one way and that is to recognise her complete equality of status with her fellows and to do so frankly, freely and unreservedly ... While one understands and sympathises with French fears, one cannot, but feel for Germany in the prison of inferiority in which she still remains sixteen years after the conclusion of the war. The continuance of the Versailles status is becoming an offence to the conscience of Europe and a danger to future peace ... Fair play, sportsmanship—indeed every standard of private and public life—calls for frank revision of the situation. Indeed ordinary prudence makes it imperative. Let us break these bonds and set the complexed-obsessed soul free in a decent human way and Europe will reap a rich reward in tranquility, security and returning prosperity. The new Tyranny, disguised in attractive patriotic colours, is enticing youth everywhere into its service. Freedom must make a great counterstroke to save itself and our fair western civilisation. Once more the heroic call is coming to our youth. The fight for human freedom is indeed the supreme issue of the future, as it has always been. After nine years in opposition and academia, Smuts returned as deputy prime minister in a 'grand coalition' government under J. B. M. Hertzog. When Hertzog advocated neutrality towards Nazi Germany in 1939, the coalition split and Hertzog’s motion to remain out of the war was defeated in Parliament by a vote of 80 to 67. Governor-General Sir Patrick Duncan refused Hertzog's request to dissolve parliament for a general election on the issue. Hertzog resigned and Duncan invited Smuts, Hertzog's coalition partner, to form a government and become prime minister for the second time in order to lead the country into World War II on the side of the Allies. On 24 May 1941 Smuts was appointed a field marshal of the British Army. 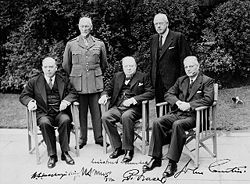 Smuts' importance to the Imperial war effort was emphasised by a quite audacious plan, proposed as early as 1940, to appoint Smuts as Prime Minister of the United Kingdom, should Churchill die or otherwise become incapacitated during the war. This idea was put forward by Sir John Colville, Churchill's private secretary, to Queen Mary and then to George VI, both of whom warmed to the idea. In May 1945, he represented South Africa in San Francisco at the drafting of the United Nations Charter. Also in 1945, he was mentioned by Halvdan Koht among seven candidates that were qualified for the Nobel Prize in Peace. However, he did not explicitly nominate any of them. The person actually nominated was Cordell Hull. In domestic policy, a number of social security reforms were carried out during Smuts’s second period in office as Prime Minister. Old-age pensions and disability grants were extended to 'Indians' and 'Africans' in 1944 and 1947 respectively, although there were differences in the level of grants paid out based on race. The Workmen’s Compensation Act of 1941 “insured all employees irrespective of payment of the levy by employers and increased the number of diseases covered by the law,” and the Unemployment Insurance Act of 1946 introduced unemployment insurance on a national scale, albeit with exclusions. Smuts continued to represent his country abroad. He was a leading guest at the 1947 wedding of Princess Elizabeth and Philip, Duke of Edinburgh. At home, his preoccupation with the war had severe political repercussions in South Africa. Smuts's support of the war and his support for the Fagan Commission made him unpopular amongst the Afrikaners and Daniel François Malan's pro-Apartheid stance won the Reunited National Party the 1948 general election. In 1948, he was elected Chancellor of the University of Cambridge, becoming the first person from outside the United Kingdom to hold that position. He held the position until his death. He accepted the appointment as Colonel-in-Chief of Regiment Westelike Provinsie as from 17 September 1948. On 29 May 1950, a week after the public celebration of his eightieth birthday in Johannesburg and Pretoria, he suffered a coronary thrombosis. He died of a subsequent heart attack on his family farm of Doornkloof, Irene, near Pretoria, on 11 September 1950. It had very much in common with his philosophy of life as subsequently developed and embodied in his Holism and Evolution. Small units must develop into bigger wholes, and they in their turn again must grow into larger and ever-larger structures without cessation. Advancement lay along that path. Thus the unification of the four provinces in the Union of South Africa, the idea of the British Commonwealth of Nations, and, finally, the great whole resulting from the combination of the peoples of the earth in a great league of nations were but a logical progression consistent with his philosophical tenets. The old practice mixed up black with white in the same institutions, and nothing else was possible after the native institutions and traditions had been carelessly or deliberately destroyed. But in the new plan there will be what is called in South Africa "segregation"; two separate institutions for the two elements of the population living in their own separate areas. Separate institutions involve territorial segregation of the white and black. If they live mixed together it is not practicable to sort them out under separate institutions of their own. Institutional segregation carries with it territorial segregation. These children of nature have not the inner toughness and persistence of the European, not those social and moral incentives to progress which have built up European civilization in a comparatively short period. Although Gandhi and Smuts were adversaries in many ways, they had a mutual respect and even admiration for each other. Before Gandhi returned to India in 1914, he presented General Smuts with a pair of sandals (held by Ditsong National Museum of Cultural History) made by Gandhi himself. In 1939, Smuts, then prime minister, wrote an essay for a commemorative work compiled for Gandhi's 70th birthday and returned the sandals with the following message: "I have worn these sandals for many a summer, even though I may feel that I am not worthy to stand in the shoes of so great a man." Smuts is often accused of being a politician who extolled the virtues of humanitarianism and liberalism abroad while failing to practise what he preached at home in South Africa. This was most clearly illustrated when India, in 1946, made a formal complaint in the UN concerning the legalised racial discrimination against Indians in South Africa. Appearing personally before the United Nations General Assembly, Smuts defended the policies of his government by fervently pleading that India's complaint was a matter of domestic jurisdiction. However, the General Assembly censured South Africa for its racial policies and called upon the Smuts government to bring its treatment of the South African Indians in conformity with the basic principles of the United Nations Charter. At the same conference, the African National Congress President General Alfred Bitini Xuma along with delegates of the South African Indian Congress brought up the issue of the brutality of Smuts' police regime against the African Mine Workers' Strike earlier that year as well as the wider struggle for equality in South Africa. The idea that the Natives must all be removed and confined in their own kraals is in my opinion the greatest nonsense I have ever heard. The Fagan Commission did not advocate the establishment of a non-racial democracy in South Africa, but rather wanted to liberalise influx controls of Africans into urban areas in order to facilitate the supply of African labour to the South African industry. It also envisaged a relaxation of the pass laws that had restricted the movement of Africans in general. In 1943 Weizmann wrote to Smuts, detailing a plan to develop Britain's African colonies to compete with the United States. During his service as Premier, Smuts personally fundraised for multiple Zionist organisations. His government granted de facto recognition to Israel on 24 May 1948 and de jure recognition on 14 May 1949 (following the defeat of Smuts' United Party by the Reunited National Party in the 26 May 1948 General Election, 12 days after David Ben Gurion declared Jewish Statehood, the newly formed nation being given the name Israel). However, Smuts was deputy prime minister when the Hertzog government in 1937 passed the Aliens Act that was aimed at preventing Jewish immigration to South Africa. The act was seen as a response to growing anti-Semitic sentiments among Afrikaners. One of his greatest international accomplishments was the establishment of the League of Nations, the exact design and implementation of which relied upon Smuts. He later urged the formation of a new international organisation for peace: the UN. Smuts wrote the first draft of the preamble to the United Nations Charter, and was the only person to sign the charters of both the League of Nations and the UN. He sought to redefine the relationship between the United Kingdom and her colonies, helping to establish the British Commonwealth, as it was known at the time. This proved to be a two-way street; in 1946 the General Assembly requested the Smuts government to take measures to bring the treatment of Indians in South Africa into line with the provisions of the United Nations Charter. In 1932, the kibbutz Ramat Yohanan in Israel was named after him. Smuts was a vocal proponent of the creation of a Jewish state, and spoke out against the rising anti-Semitism of the 1930s. The international airport serving Johannesburg was known as Jan Smuts Airport from its construction in 1952 until 1994. In 1994, it was renamed to Johannesburg International Airport to remove any political connotations. In 2006, it was renamed again to its current name, OR Tambo International Airport, for the ANC politician Oliver Tambo. In 2004 Smuts was named by voters in a poll held by the South African Broadcasting Corporation (SABC) as one of the top ten Greatest South Africans of all time. The final positions of the top ten were to be decided by a second round of voting but the program was taken off the air owing to political controversy and Nelson Mandela was given the number one spot based on the first round of voting. In the first round, Field Marshal Smuts came ninth. Mount Smuts is named for him. Field Marshal Smuts was honoured with orders, decorations and medals from several countries. ^ Root, Waverley (1952). "Jan Christiaan Smuts. 1870-1950". Obituary Notices of Fellows of the Royal Society. 8 (21): 271–73. doi:10.1098/rsbm.1952.0017. JSTOR 768812. ^ "Jan Smuts – Britain's Greatest General – Online Exhibitions – National Army Museum, London". Archived from the original on 2 March 2016. Retrieved 21 February 2016. ^ "Smuts, Jan Christian (SMTS891JC)". A Cambridge Alumni Database. University of Cambridge. ^ a b "Durban Branch November 1998 News Sheet No.285". South African Military History Society. Retrieved 17 May 2013. ^ Smith, Norman Kemp. A Commentary to Kant's Critique of Pure Reason. ^ Williams, Basil (1946). Botha Smuts And South Africa. Hodder And Stoughton. pp. 52–53. Retrieved 14 October 2010. ^ a b "General Jan Christiaan Smuts". South African History On-line. Retrieved 17 May 2013. ^ a b "Formation of the Union of South Africa". Salem Press. Archived from the original on 13 August 2013. Retrieved 17 May 2013. ^ a b "Old Resentments Return". Retrieved 27 May 2013. ^ "No. 29477". The London Gazette (Supplement). 15 February 1916. p. 1791. ^ "No. 29886". The London Gazette (Supplement). 29 December 1916. p. 15. ^ "Sir David Henderson". Lions Led By Donkeys. Centre for First World War Studies, University of Birmingham. Retrieved 26 July 2007. ^ Barrass, Malcolm. "Lieutenant General Sir David Henderson". Air of Authority – A History of RAF Organisation. Retrieved 26 July 2007. ^ Farwell, Byron (1999). Over There: The United States in the Great War, 1917–1918. ^ Smuts (1934) pp. 28–29. ^ Editors, The. "J.B.M. Hertzog | prime minister of South Africa". Britannica.com. Retrieved 2017-08-10. ^ "No. 35172". The London Gazette (Supplement). 23 May 1941. p. 3004. ^ "Record from The Nomination Database for the Nobel Prize in Peace, 1901–1956". Nobel Foundation. Archived from the original on 8 October 2014. Retrieved 14 May 2010. ^ "Social assistance in South Africa: Its potential impact on poverty" (PDF). Retrieved 26 February 2016. ^ "Seating plan for the Ball Supper Room". Royal Collection. Retrieved 17 May 2013. ^ Chancellors of the University of Cambridge. British History Online. Retrieved on 30 July 2012. ^ Smuts, J.C. (1927). Holism and evolution. Рипол Классик. ISBN 978-5-87111-227-4. ^ a b "Race Segregation In South Africa New Policies and Factors in Race Problems" (PDF). Journal of Heredity. Oxford Journals. 1930. p. 21 (5): 225–233. ISSN 0022-1503. Retrieved 1 May 2010. (Subscription required (help)). ^ "Following the footsteps of a great man". Sunday Times. Archived from the original on 9 January 2009. Retrieved 30 April 2006. ^ a b c "United Nations General Assembly Resolution A/RES/44(I)" (PDF). United Nations General Assembly. 8 December 1946. Archived from the original (PDF) on 26 September 2012. Retrieved 7 June 2011. ^ "Unverified article attributed to the Delhi News Chronicle". South African Communist Party. 25 September 1949. Retrieved 1 May 2010. ^ R.E.Press. "The miners strike of 1946". Anc.org.za. Archived from the original on 11 October 2009. Retrieved 1 May 2010. ^ "Jan Christiaan Smuts, South African History Online". Sahistory.org.za. Retrieved 1 May 2010. ^ "General Jan Christiaan Smuts". South African History Online. 2015. Retrieved 21 September 2015. ^ "Fagan Commission and Report". Africanhistory.about.com. 26 May 1948. Retrieved 1 May 2010. ^ "South Africa – The Great Depression and the 1930s". Countrystudies.us. Retrieved 1 May 2010. ^ Lockyer, Norman. Nature, digitized 5 February 2007. Nature Publishing Group. ^ "Jewish American Year Book 5695" (PDF). Jewish Publication Society of America. 1934. Retrieved 12 August 2006. ^ "The History of OR Tambo International Airport". Retrieved 17 May 2013. ^ "SA se gewildste is Nelson Mandela". Archived from the original on 6 October 2011. Retrieved 17 May 2013. ^ Place-names of Alberta. Ottawa. 1928. Hancock, W.K. ; van der Poel, J. (1966–73). Selections from the Smuts' Papers, 1886–1950. 7. Smuts, J.C. (1934). Freedom. Alexander Maclehose & Co. ASIN B006RIGNWS. Smuts, J.C. (1940). The Folly of Neutrality – Speech by the prime Minister. Union Unity Truth Service. Beit-Hallahmi, Benjamin (1988). The Israeli Connection: Whom Israel Arms and Why. I.B. Tauris. ISBN 978-1850430698. Cameron, Trewhella (1994). Jan Smuts: An Illustrated Biography. Human & Rousseau. ISBN 978-0-798-13343-2. Colville, John (2004). The Fringes of Power. Weidenfeld & Nicolson. ISBN 978-0-297-84758-8. Crafford, F.S. (1943). Jan Smuts: A Biography. Kessinger Publishing. ISBN 1-4179-9290-5. Crossman, R.H.S. (1960). A nation reborn;: A personal report on the roles played by Weizmann, Bevin and Ben-Gurion in the story of Israel. Atheneum Publishers. ASIN B0007DU0X2. Crowe, J.H.V. (2009). General Smuts' Campaign in East Africa. Naval and Military Press. ISBN 978-1-843-42949-4. Dugard, John (1973). The South West Africa/Namibia Dispute: Documents and Scholarly Writings on the Controversy Between South Africa and The United Nations. University of California Press. ISBN 0-520-02614-4. Gooch, John (2000). The Boer War: Direction, Experience and Image. Routledge. ISBN 978-0-714-65101-9. Hancock, W.K. (1962). Smuts: 1. The Sanguine Years, 1870—1919. Cambridge University. ASIN B0006AY7U8. Hancock, W.K. (1968). Smuts: 2. Fields of Force, 1919–1950. Cambridge University. ISBN 978-0-521-05188-0. Howe, Quincy (1949). A World History of Our Own Times. Simon and Schuster. ASIN B0011VZAL6. Hunter, Jane (1987). Israeli Foreign Policy: South Africa and Central America. Spokesman Books. ISBN 978-0-851-24485-3. Kee, Robert (1988). Munich. Hamish Hamilton. ISBN 978-0-241-12537-3. Klieman, Aaron S. (1991). Recognition of Israel: An End & a New Beginning: An End and a New Beginning. Routledge. ISBN 978-0-824-07361-9. Smuts, J.C. (1952). Jan Christian Smuts by his son. Cassell. ISBN 978-1-920-09129-3. Spies, S.B. ; Natrass, G. (1994). Jan Smuts: Memoirs of the Boer War. Jonathan Ball, Johannesburg. ISBN 978-1-868-42017-9. Woodward, David R. (1998). Field Marshal Sir William Robertson. Praeger. ISBN 0-275-95422-6. Armstrong, H.C. (1939). Grey Steel: A Study of Arrogance. Penguin. ASIN B00087SNP4. Friedman, Bernard (1975). Smuts: A Reappraisal. Allen & Unwin. ISBN 978-0-049-20045-6. Geyser, Ockert (2002). Jan Smuts and His International Contemporaries. Covos Day Books. ISBN 978-1-919-87410-4. Hutchinson, John (1946). A Botanist in Southern Africa. PR Gawthorn Ltd. ASIN B0010PNVVO. Ingham, Kenneth (1986). Jan Christian Smuts: The Conscience of a South African. Palgrave Macmillan. ISBN 978-0-312-43997-2. Lentin, Antony (2010). General Smuts: South Africa. Haus. ISBN 978-1-905791-82-8. Millin, Sarah (1936). General Smuts. 2. Faber & Faber. ASIN B0006AN8PS.